What’s All the Fuss About Cauliflower? Not since kale made its debut at the dinner table has a vegetable gotten as much media attention as 2016’s infatuation with cauliflower. The great “cauliflower crisis” has prices topping out at $9 per head and has put this cruciferous vegetable in the spotlight as the California growing season got cut short. As a healthy mealtime favourite, we think this hearty cousin to broccoli deserves all of this attention and more. While white cauliflower is most commonly found in the grocery store, there is no need to be intimidated by the colourful varieties. Orange cauliflower is rich in beta carotene (25% more vitamin A than the white variety), purple cauliflower gets it’s beautiful hue from the presence of the antioxidant anthocyanin (also found in red wine) and green cauliflower is a broccoli hybrid. Whichever you choose, it is sure to add a beautiful pop of colour to your dish. When purchasing a cauliflower be sure that it is firm and free of brown spots. The first step in preparation is to remove all of the outer leaves and to cut off the stem, which can both be used later on in a vegetable stock. To cut the perfect florets, turn the cauliflower upside down and, using a circular motion, slice into the smaller stems. Wash and either serve raw or cooked, as desired. 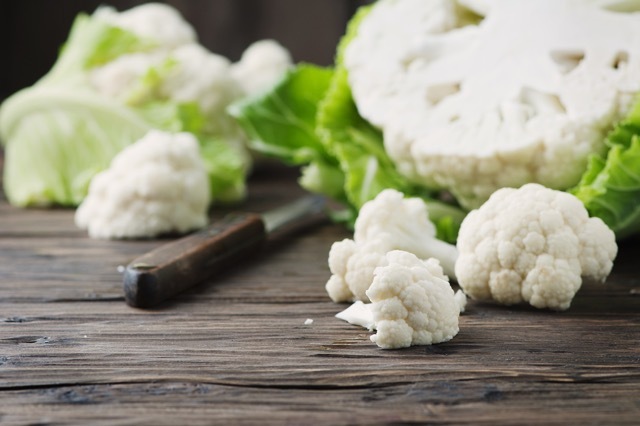 Florets can quickly be boiled, steamed, sautéed, roasted or stir-fried, making it extremely easy to integrate cauliflower into your favourite recipe. As well, it can be chopped and cooked into gluten-free pizza crust or rice. This week, cauliflower is proving to be the perfect side dish ingredient for our Culiniste menu. We have paired it with the all-powerful kale in a cheesy casserole complete with béchamel sauce. It can often be spotted on our weekly menus incorporated into dishes of all kinds. The way we see it, cauliflower definitely calls for a celebration, everyday of the week!